Mission Statement Verde Valley School educates students for college and for life by encouraging them to become intellectually curious, academically accomplished and creatively expressive. The program fosters intercultural understanding and world citizenship, environmental stewardship, the value of physical labor, and service to humanity with a willing spirit. Services and Projects Located in Sedona, Arizona, Verde Valley School is an international college preparatory boarding school and day school offering the International Bacccalaureate Diploma Programme as its sole curriculum. Founded in 1948 by Hamilton and Barbara Warren, VVS was built on their dream: "If we bring together talented young people from around the world and ask them to build and to study, to work and to learn, we can change the world for the better." VVS continues to live this ideal, today. VVS inspires the best in young peoples' hearts as well as their minds. It is a boarding school dedicated to the highest ethical and academic standards teaching languages and cross-cultural communication, anthropology and responsibility, biology and environmentalism, and the arts through self expression. Verde Valley School offers boarding school and day school students an experience that will last a lifetime. VVS . College Prep . World Prep. VVS is home to 130 curious and tenacious adventurers - 52 percent are from the United States, 48 percent are from international countries. Here, inspired by the beauty of Sedona, students build strong academic skills, discover their individual talents, experience diverse cultures, and form life-long friendships with teachers and peers. Ever wonder...about Verde Valley School? 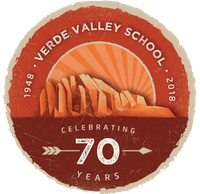 Verde Valley School is a 501(c)(3) non-profit boarding and day high school, with an international population, that focuses on five guiding principles - world citizenship, academic excellence, service to others, environmental stewardship and physical labor. To learn more about Verde Valley School and what you can do to support our mission, go to vvsaz.org/annualfund! As a partner in the Backpacks for Kids program with Big Park Community School, we are in need of backpacks, reusable bags, tote bags, and anything along these lines to help with the weekend food program.